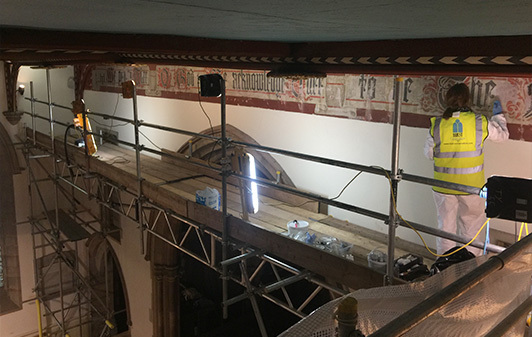 Just in time for the Christmas celebrations we completed a programme of conservation and restoration works to two wall paintings in the nave of the church of St John the Evangelist in Sharow, North Yorkshire for PPIY Architects and Walter West Builders. St John’s is a Grade II stone building, designed by civil engineer George Knowles and completed in its original form in 1825. The marks of later alterations to its layout could be clearly seen in the condition of paintings before conservation. The outline of a blocked entrance to the gallery, removed in 1870s showed as a ghosting blackened arch to the upper west wall, accompanied by a wide, draughty fracture, displacement of plaster substrate and flaking paint. The shape of the roof of the chancel, added in 1873 was clearly visible as two diagonal fractures located centrally above the chancel arch. 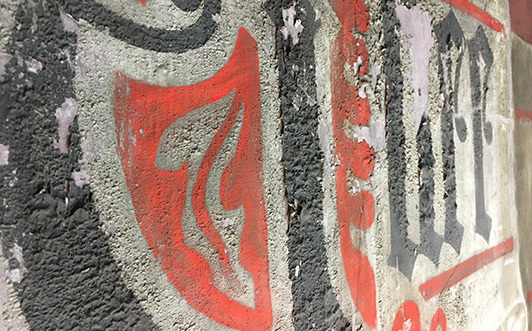 The main challenges of the project were stabilisation of the deteriorating soft distemper to the east wall inscription and cleaning of the west wall oil painting which was suffering from a variety of localised issues. A detailed condition survey was undertaken prior to treatment, which included moisture profiling, thermography and limited analysis of soluble salts. Samples of paint layers were analysed to understand the stratigraphy and characteristics of the original and added coatings and allow an informed selection of materials to test for consolidation and cleaning. 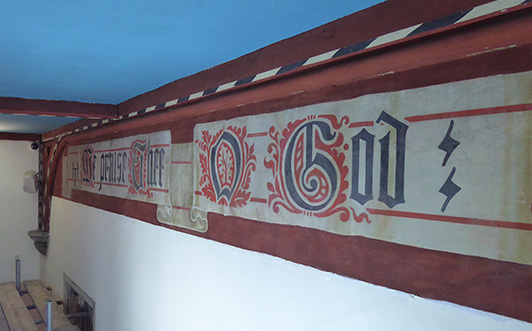 We established that the east wall inscription consisted largely of the original distemper layer with some amount of modern emulsion overpaint to the areas of damage, whilst the west wall decoration had been overpainted several times, probably in order to accommodate the structural alterations. East wall painting was in a very friable state and required a significant amount of overall consolidation, followed by grouting of the unstable plaster and filling of the adjacent fractures. Retouching was aimed to improve the aesthetics but also legibility of the partially wiped off inscription. West wall decoration had been covered in the past with a modern translucent coating, which yellowed slightly and accumulated a large amount of surface dirt. 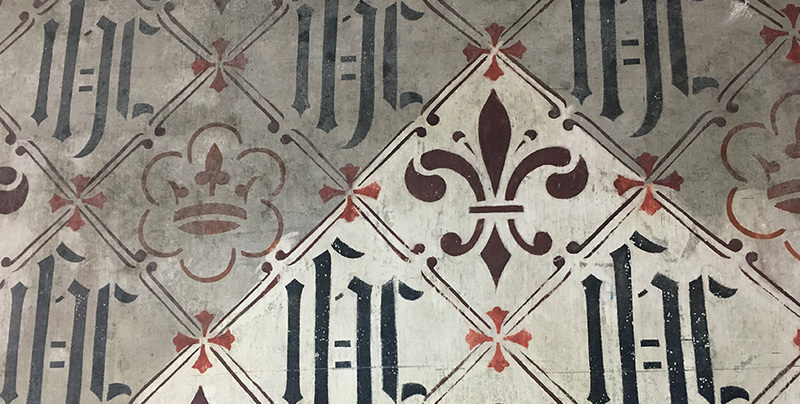 Several tests lead to a conclusion that cleaning or removal of the coating with any water or solvent based solutions was either ineffective or damaging to the areas of painting previously affected by the water ingress. The preferred method emerged following further tests of several types of dry pads and erasers. In effect the initial clean was undertaken using Milan and Maped erasers of varying hardness, as well as vulcanised latex pads in the most friable areas. Careful aqueous cleaning was used locally to remove the infestation of black mould, growing on the patches of brown substance, potentially a previous paint consolidation adhesive. Further treatment included stabilisation of very large paint flakes, fracture filling, limited retouching, and application of a final protective varnish. St John’s is a fascinating building, worth visiting when in the Ripon area. It features a set of stained glass windows, including the Adoration of the Magi to the design of Edward Burne-Jones, but also one of only two in the country stained glass windows celebrating Queen Victoria’s diamond jubilee, hidden up in the bell tower. Further information on the building and its conservation can be found on the church’s website https://stjohnssharow.org.uk/ and their Facebook page https://en-gb.facebook.com/stjohnssharow/. Video footage featuring Hirst Conservation works can be seen at https://en-gb.facebook.com/stjohnssharow/videos/1860635897283434/ and an interview covering the entire treatment will be available shortly in our News section.